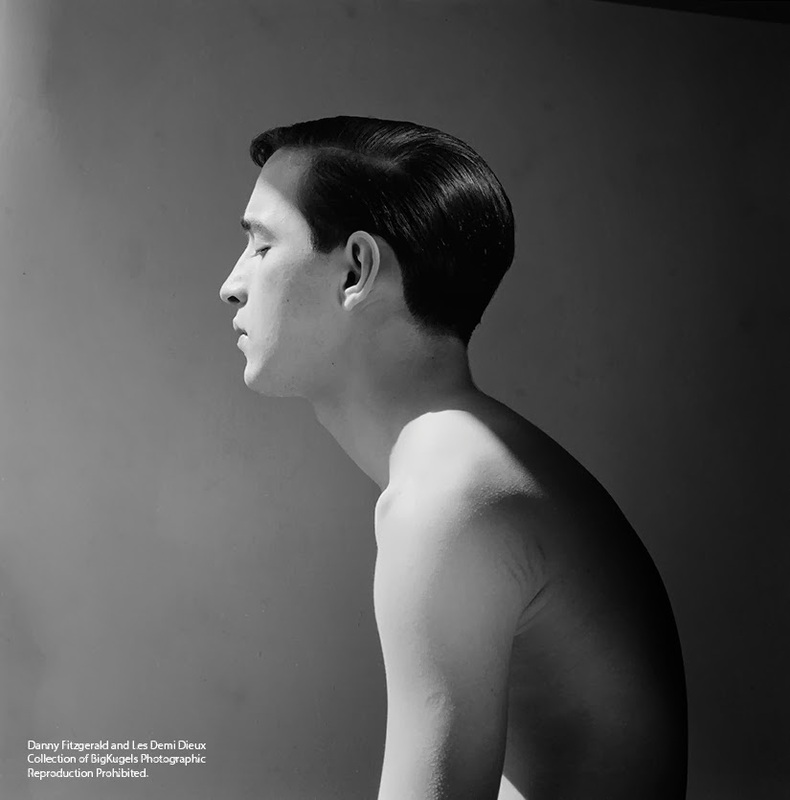 Surprisingly contemporary in his approach to both the male physique and photographic technique, the photographer behind the studio “Les Demi Dieux” was little known among collectors until after his death. Danny Fitzgerald (1921-2000) was born in Brooklyn, New York to first-generation Italian-Irish parents, and developed a love for art and film from an early age. Though he would travel the world with his camera and his partner Richard Bennett at his side, the working-class Italian-American neighborhood of Carroll Gardens, Brooklyn remained his home and the backdrop to much of his photography. Danny Fitzgerald, who came of age in Brooklyn of the 1930s, lived almost his entire life in his parent’s home in the heart of Carroll Gardens. The local family-run stores, Italian social clubs, the parks, churches and schools of his neighborhood, situated snuggly between the Brooklyn-Queens Expressway and Gowanus Canal, distinguished the community from the rest of Red Hook and Gowanus surrounding it. Here Italian-American families had found their home in the brownstones built a half-century earlier. Ethnic bakeries, butchers and delis lined Henry, Court and Smith Streets, where locals knew one another, and their children played together. Even today, Saint Mary Star of the Sea, the grand Catholic cathedral on Court Street, built from the finest stone imported from Italy, still boasts that it was the setting for notorious gangster Al Capone’s marriage to his Irish sweetheart Mae Coughlin. And the procession of Santa Maria Addolorata still meanders the streets from Union to 4th, from the Scotto Funeral Home to the steps of Sacred Hearts of Jesus and Mary and Saint Stephen Church, as it has every September since the neighborhood first began to define itself in the 1940s. Fitzgerald watched the neighborhood grow throughout his teens and 20s, and by the time he was a 30-year-old bachelor in the 1950s, the neighborhood had become the firm center of Italian-American family life and its children owned its streets with the swagger that would become synonymous with their culture. Prominent among them were the notorious New York City street gangs known as the “South Brooklyn Boys.” In the 1950s, several Italian-American greaser gangs formed around the area known at that time as “South Brooklyn,” which encompassed Carroll Gardens, Cobble Hill, Park Slope, Red Hook and Boerum Hill. They were not unlike the Irish and Puerto Rican gangs of Manhattan that we see in the film version of the musical West Side Story. The Brooklyn gangs had names like “The South Brooklyn Devils,” “South Brooklyn Angels,” the “Diapers,” “The Wanderers,” “The Garfield Boys,” “Degraw Street Boys,” “Gowanus Boys,” and “The Kane Street Midgets.” These gangs became loosely affiliated as the “South Brooklyn Boys” over the next decade, and since then, reference to “South Brooklyn Boys” has come to represent not only the original 1950s gangs, but also many generations of youths who grew up in the area, and most specifically those from the Italian section of Carroll Gardens. Understandably then, a man like Fitzgerald, who was physically smaller, with the sensitivities and curiosity of his Irish mother, interests in art, film, opera, aesthetic philosophy and literature, and who harbored deeply hidden homosexual feelings, would find it difficult to thrive in this setting, even as a 37-year-old confirmed bachelor who had lived there his whole life. While he could expound on his favorite topics in carefully selected circles, he was deeply private and misunderstood by much of his own family and the community that surrounded him. Fitzgerald’s note scraps and periodical clippings from the 1940s and ’50s suggest that he looked beyond his immediate neighborhood to satisfy what they could never know or understand. With little annotation, they suggest that he found solace in Manhattan: at the latest Tennessee Williams play or Tuesday Night movies at the Trans-Lux Theater, the fall fashion line at Bergdorf Goodman’s, or the Greek, pre-Columbian or Asian collections at the Metropolitan Museum of Art. There are also numerous Strength & Health and Your Physique magazine clippings, some of famous bodybuilders like John Grimek, Sandow, Horvath, the Ritter Brothers, Monroe Brown’s photos of Robert Gebbé, and Edwin Townsend’s nudes of Brooklyn bodybuilder Tony Sansone. Sansone operated his Brooklyn gymnasium less than a mile from Fitzgerald’s home, and while Fitzgerald would later tell Richard Bennett stories of having visited Sansone’s studio, there are no notes of his visits there or to any other gym until later, after he took up photography. As for the homosexual speakeasies and haunts of New York of the time, the only mention is an obscure diary fragment noting that Jean Cocteau frequented the same kind of bars that Fitzgerald frequented. But a separate strain of newspaper articles on teen murderers and juvenile delinquents, boy scouts and valiant young draftees, filter here and there through the clippings, hinting at the photographer’s deepest curiosity and secret sense of himself.